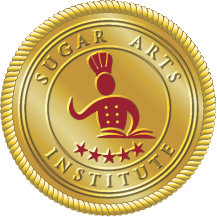 Classes - Sugar Arts Institute: Cake Decorating Classes, Receptions, Functions. 1. Classes are held in Ephrata Pa. (Lancaster County) Classes are small and personal and fill quickly, so book early. 2. There are several hotels, motels, Inns and B & B’S nearby. 3. All supplies and course materials are provided in each class. Some tools and supplies will be offered for sale with student discounts on course day. 4. *A light lunch will be provided, when noted. 1. VISA, MC and DISCOVER credit cards, and checks are accepted. You may register on-line in the SAI store, or register directly with me on the phone. 2. Gift Certificates make great gifts we offer class gift certificates. Gift certificates are non-refundable. 1. Class fees (less 10% administration fee) are refundable if class is cancelled within 14 days from class date. No refunds apply within 14 days of class date. No make-up classes are offered as the classes are seldom repeated, however, on discretion, we may offer an alternative class. 2. Classes may be rescheduled due to inclement weather and will usually be scheduled for the same day/s the following week. 3. Refunds will apply for enrolled students who are unable to attend on the new dates. 1. Philadelphia International Airport - Take the train from the airport on the SEPTA line to 30th Street Station, then connect on AMTRAK to Lancaster Train Station. The trains to Lancaster run frequently. We will pick up and return student to the train station before and after class. This service is complimentary. 2. Harrisburg International Airport - We will collect and return student from Harrisburg airport for a roundtrip $90.00 fee. 3. Hotel/Motel to class. We will collect and return student daily to a hotel/motel within a 5-mile radius from Ephrata. This service is complimentary. Recommended Hotel: Hampton Inn and Suites, Mountain Springs, Ephrata. 1. All supplies and tools are provided for every class. Select tools and supplies will be on sale after each class. 2. Please bring your own apron. Classes are shown by category. Find the class of interest, then check the dates. 4. As we are working with food products, please keep long hair tied back. Disposable aprons are offered. 5. Closed in shoes are recommended for students taking blown and pulled sugar courses. 6. Some classes are duplicated on different dates. 7. Registration is confirmed only on payment. 8. Payment plans are accepted providing class is paid in full two weeks prior to class date. Call for assistance. 1. Parents may drop off and pick up children for class. Pre-registration and consent forms must be completed when registering for the class. 2. Important: Please note the nuts and wheat may be used in the classes. 3. Due to limited space, parents may not observe the class. 4. Parents wishing to stay with their children must pay the class fee to attend and participate. 5. If parents are not picking up their children, a guardian must be approved by parents prior to class date and ID’s will be checked. Your children’s safety is our utmost concern. Please note that we offer private classes for students wanting to learn specific techniques. I will be happy to put a class schedule together that meets with your dates and requirements. Please call to discuss details and pricing. APPLE BLOSSOMS, ALSTROEMERIA, PEONY & FOLIAGE. Create life-like seasonal spring and summer flowers to add to your gum paste flower repertoire. Use new and different techniques for these beautiful flowers. Peony, Alstroemeria, and Apple Blossoms, with their unique foliage. Fondant cakes are elegant, beautiful and in great demand. This course will take your cake decorating to a new level. Learn to cover a cake with thin rolled fondant. Learn a variety of fondant techniques including ruffling, striping, quilting, scrunching, draping and bows. The photos show the techniques you will learn. We will not be making tiered wedding cakes. Following on from the Wedding Cake Class, this course will teach you how to turn your cake hobby into a business, from the legalities, health department regulations to food safety. You will learn how to consult with customers, design cakes, cost out and price cakes with the relevant artwork. Get samples of costing sheets, contracts, delivery forms, etc. Learn about production and timing and how to develop in-house systems that will keep you on track. Discuss the marketing and promotion of your business. And most importantly discuss the pitfalls and how to avoid them. I will share my knowledge from 30 years of experience, owning a catering business reception facility and bakery. Knowing how to price your cakes, market them, and have a working system in place, is essential for your success. Roses are the favorite of all flowers for cakes. Beautifully made into a bouquet with Lily of the Valley and Freesia. This combination is perfect for adorning wedding cakes & celebration cakes. Tape flowers and foliage together into a bouquet. The Freesia is made using the “pulled” flower technique without using cutters. This technique will open the door to a myriad of beautiful flowers that can be made without buying cutters. This class covers a variety of delicious chocolate and sugar cookie recipes especially for Easter. Celebrate with some fun Easter designs. Easter Egg cookies using different piping tips for eye catching simple designs and drop flowers. Learn double-layered flooding, basket-weave, crimping and delicate fondant decorations. We will decorate 8-10 different cookie designs. A light lunch and beverages will be provided on both days. The Cymbidium and Cattleya orchid made in gum paste and hand colored to look so real. We will also make the appropriate foliage for each orchid. Learn to pipe flowers and attractive borders in buttercream and royal icing. Learn to pipe 3d filigree in royal icing which adds dimension and delicate beauty to your cake. Learn the art of color flow, that can be used to decorate cookies and make cake toppers. This intensive two-day piping class is fun and will open the doors to a new world of cake decorating creativity. Carve and assemble a layered handbag cake. Make Swiss Meringue Buttercream to ice cake. Decorate it with textured distressed leather in fondant. Carve your layered cake into a handbag shape using templates for patterns. Ice and decorate with textured distressed leather fondant. Learn to make stitches, grommets, handles, buckles and tags to complete this cake design. Time allowing, we will add a gilded monogram. Texturing in fondant, gum paste and modeling chocolate. Learn how to make modeling chocolate. Once you know how to make these textures, you can apply them to a variety of cakes, e.g. Handbags, cupcake toppers, clothing, rustic cakes themes, etc. Brick, Cobblestones, Stone-tiles, Wood-bark, Wood-grain, Basket-weave, Leather, Denim, Knitting, Giraffe-hide, Leopard-hide, Zebra-stripes, Cow-hide. Cake toppers are the most important feature on a cake. This course will teach you a variety different and of fun techniques to create toppers for adults, children, men and women. Once you know how, you can use these techniques for your own creative designs. BLOWN & PULLED SUGAR, INTERMEDIATE – 2 Day Class (16 hrs.) Saturday/Sunday October 5th & 6th – 9:00am-5:00pm $275.00. The oldest and most fascinating of all sugar arts. Learn to cook Isomalt so that it is crystal clear. This is an intensive 2-day class. Continuing from the beginner’s class, create beautiful swans, and a Christmas winter display with Santa and Snowman, icicles and snowflakes. Learn to Decorate cupcakes for all occasions. This is a fun class for all ages. Create cupcakes for birthdays and celebrations. Animal cupcakes, Fancy textured cupcakes, Elegant Cupcakes. This “all hands-on” class will teach you the important fundamentals of cookie decorating using techniques that can be used for any themed cookie. This class covers delicious cookie recipes, baking tips, mixing royal icing, including different consistencies for various techniques, easy piping, marbling, painted cookies, decorative accents, simple flowers and leaves for fall designs. These cookies have a long shelf life and/or may be frozen for Thanksgiving. We will decorate 6 different cookies in this class. Going on from beyond the basics, learn more advanced decorating techniques. Have fun creating a variety of eye catching designs to create 2D and 3D effects, texturing, stenciling, wet-on-wet, flooding build-up, piped dots and stripes. Isomalt windows give cookies the ultimate Christmas effect. Get new recipes and try more advanced techniques!